Diets that contain many fruits and vegetables rich in carotenoids like lycopene can help prevent some types of cancers and heart problems. However, not enough research has been done to say whether lycopene supplements have the same effect. Lycopene is a natural pigment that is produced by plants and microorganisms. Laboratory experiments with lycopene confirm that it acts as an antioxidant and affects the way cells grow and communicate with each other, although it is not as potent as beta-carotene. Scientists have proposed several different mechanisms by which lycopene might fight cancer. These include stopping cancer cell growth, preventing DNA damage, and enhancing enzymes that break down cancer-causing products. Studies in healthy elderly patients suggest that consumption of lycopene or tomato juice does not stimulate the immune system. In general, diets rich in carotenoids like lycopene have been associated with decreased risk of macular degeneration, cataracts, some types of cancers, and some heart problems. Lycopene is an antioxidant. One clinical trial suggested that preventative use of lycopene supplements reduces the spread of localized prostate cancer, but there is no other proof from clinical trials that lycopene can treat cancer. Diets rich in carotenoids like lycopene are generally associated with a decreased risk of certain types of cancers. One clinical trial showed that daily lycopene supplementation protected against exercise-induced asthma, but no additional studies have been performed to confirm this. Diets rich in carotenoids like lycopene are generally associated with a decreased risk of some cardiovascular events. However, there is no proof that lycopene supplements have the same effect. Diets rich in carotenoids like lycopene are generally associated with a decreased risk of macular degeneration. However, there is no proof that lycopene supplements have the same effect. Negative interactions between chronic alcohol ingestion and lycopene supplementation have been demonstrated and suggest a need for caution among individuals consuming high amounts of both alcohol and lycopene. After long-term ingestion of large quantities of lycopene-rich foods (i.e. tomato products), some individuals may develop lycopenaemia, a deep orange discoloration of the skin. Laboratory studies demonstrate a possible interaction between high-dose lycopene and chronic alcohol consumption. An analysis of six commercially available brands revealed that lycopene content varied from the labeled dosage by as much as 43%. A natural pigment synthesized by plants and microorganisms, lycopene is used primarily as an antioxidant and also to prevent and treat cancer, heart disease, and macular degeneration. Lycopene is classified as a non-provitamin A carotenoid, other examples being lutein and zeaxanthin. Alpha-carotene, beta-carotene, and beta-cryptoxanthin are classified as provitamin A carotenoids because they can be converted into retinol. Small clinical trials suggest possible benefit against exercise-induced asthma (1) and benign prostatic hyperplasia (BPH) (2). However, no optimal dosage has been established. Data from observational studies indicate an inverse association of lycopene consumption with risk of developing cardiovascular disease (CVD) (26), with a randomized study reporting improvements in endothelial function in CVD patients, but not in healthy volunteers (27). In animal models, lycopene enhanced antitumor efficacy of docetaxel against prostate cancer (22). Epidemiologic studies suggest an inverse relationship between lycopene consumption and risk of cancer (3), particularly lung (4), stomach (5), prostate (6), and hormone-positive breast cancers (7). A consistent association between lycopene consumption and endometrial cancer risk has yet to be reported (8) (9). 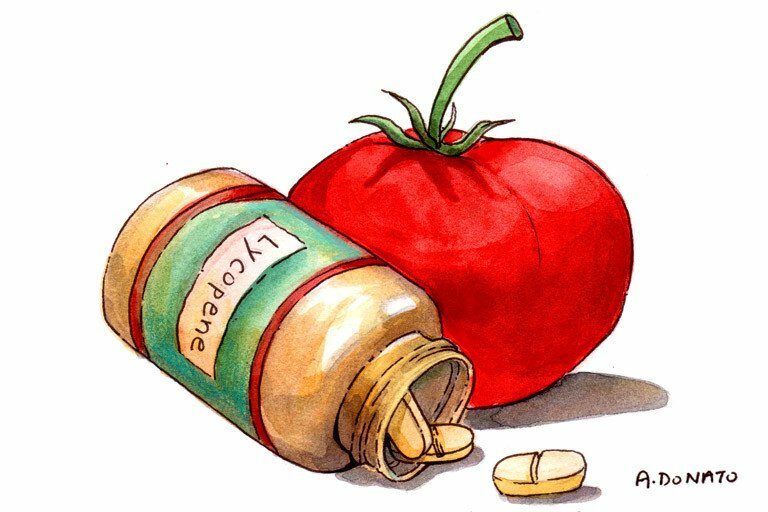 Clinical data on lycopene supplementation for prostate cancer prevention remain inconclusive. Whereas low intake of tomato sauce was associated with advanced prostate cancer in patients with low-grade cancer at diagnosis (10), other studies indicate that lycopene or tomato-based regimens do not prevent prostate cancer (11) (23) (31). In men with high-grade prostatic intraepithelial neoplasia (PIN), a lycopene-rich extract did not confer any benefits (32); and high doses of lycopene, green tea catechins, and selenium were actually associated with higher prostate cancer incidence (28). Also, variable results were reported for lycopene supplementation in prostate cancer patients (12). One study suggests that increasing lycopene intake may alter the serum metabolome of men at risk of prostate cancer (33). Given these mixed results, more studies are needed to determine whether lycopene has protective effects in prostate cancer. Quality control of lycopene supplements is also a concern. An analysis of six commercially available brands revealed that lycopene content varied from the labeled dosage by as much as 43% (14). Lycopene is a natural pigment synthesized by plants and microorganisms. Referred to as a nonprovitamin A carotenoid, it is not known to have any vitamin A activity. Biological actions include antioxidant activity via singlet oxygen quenching and peroxyl radical scavenging, induction of cell to cell communication, and growth control, although this appears to occur with less efficiency than with beta-carotene (15). Preventive consumption of lycopene attenuated effects of acetaminophen-induced liver injury in a murine model (29). Proposed mechanisms of cancer-preventive effects include inhibition of cancer growth, induction of differentiation by modulation of cell cycle regulatory proteins, alterations in insulin-like growth factor-1 (16) or vascular endothelial growth factor (17) levels, prevention of oxidative DNA damage, and possible enhancement of carcinogen metabolizing enzymes (18). In human liver adenocarcinoma cells, antimetastatic activity was attributed to downregulation of NADPH oxidase 4 (NOX4), which produces reactive oxygen species (30). Other possible mechanisms for all carotenoids include immune enhancement as well as inhibition of mutagenesis and transformation, and premalignant lesions. Carotenoids are also associated with decreased risk for macular degeneration and cataracts, and some types of cancers and cardiovascular events (19). Lycopenaemia, characterized by a deep orange skin discoloration, has been reported following ingestion of large quantities of lycopene-rich foods (tomato-based products) (24) (25). A possible interaction between lycopene and alcohol consumption was demonstrated in animal model, indicating that cytochrome P450 (CYP) 2E1 expression is induced by high doses of lycopene plus alcohol (13). Neuman I, Nahum H, Ben-Amotz A. Reduction of exercise-induced asthma oxidative stress by lycopene, a natural antioxidant. Allergy 2000;55:1184-9. Schwarz S, Obermuller-Jevic UC, Hellmis E, et al. Lycopene inhibits disease progression in patients with benign prostate hyperplasia.J Nutr. Jan 2008;138(1):49-53. Olmedilla B, et al. A European multicentre, placebo-controlled supplementation study with alpha-tocopherol, carotene-rich palm oil, lutein or lycopene; analysis of serum responses. Clin Sci (Lond) 2002;102:447-56. Gallicchio L, Boyd K, Matanoski G, et al. Carotenoids and the risk of developing lung cancer: a systematic review. Am J Clin Nutr. Aug 2008;88(2):372-383. Yang T, Yang X, Wang X, Wang Y, Song Z. The role of tomato products and lycopene in the prevention of gastric cancer: a meta-analysis of epidemiologic studies. Med Hypotheses. 2013 Apr;80(4):383-8. Etminan M, Takkouche B, Caamano-Isorna F. The role of tomato products and lycopene in the prevention of prostate cancer: A meta-analysis of observational studies. Cancer Epidemiol Biomarkers Prev 2004;13(3):340-345. Cui Y, Shikany JM, Liu S, et al. Selected antioxidants and risk of hormone receptor-defined invasive breast cancers among postmenopausal women in the Women’s Health Initiative Observational Study. Am J Clin Nutr. Apr 2008;87(4):1009-1018. McCann SE, Freudenheim JL, Marshall JR, et al. Diet in the epidemiology of endometrial cancer in western New York (United States).Cancer Causes Control. Dec 2000;11(10):965-974. Pelucchi C, Dal Maso L, Montella M, et al. Dietary intake of carotenoids and retinol and endometrial cancer risk in an Italian case-control study.Cancer Causes Control. Dec 2008;19(10):1209-1215. Giovannucci E, Liu Y, Platz EA, et al. Risk factors for prostate cancer incidence and progression in the health professionals follow-up study. Int J Cancer. 2007;121(7):1571-8. Peters U, Leitzmann MF, Chatterjee N, et al. Serum Lycopene, other carotenoids, and prostate cancer risk: a nested case-control study in the prostate, lung, colorectal, and ovarian cancer screening trial. Cancer Epidemiol Biomarkers Prev 2007; 16(5):962-8. Van Patten CL, de Boer JG, Tomlinson Guns ES. Diet and dietary supplement intervention trials for the prevention of prostate cancer recurrence: a review of the randomized controlled trial evidence. J Urol. Dec 2008;180(6):2314-2321; discussion 2721-2312. Veeramachaneni S, Ausman LM, Choi SW, et al. High dose lycopene supplementation increases hepatic cytochrome P4502E1 protein and inflammation in alcohol-fed rats.J Nutr. Jul 2008;138(7):1329-1335. Feifer AH, Fleshner NE, Klotz L. Analytical accuracy and reliability of commonly used nutritional supplements in prostate disease. J Urol 2002;168:150-4. Stahl W, Sies H. Lycopene: a biologically important carotenoid for humans? Arch Biochem Biophys 1996;336:1-9. Voskuil DW, Vrieling A, Korse CM, et al. Effects of lycopene on the insulin-like growth factor (IGF) system in premenopausal breast cancer survivors and women at high familial breast cancer risk. Nutr Cancer. May-Jun 2008;60(3):342-353. Grainger EM, Kim HS, Monk JP, et al. Consumption of dietary supplements and over-the-counter and prescription medications in men participating in the Prostate Cancer Prevention Trial at an academic center.Urol Oncol. Mar-Apr 2008;26(2):125-132. Kucuk O, et al. Phase II randomized clinical trial of lycopene supplementation before radical prostatectomy. Cancer Epidemiol Biomarkers Prev 2001;10:861-8. Schuurman A, et al. A prospective cohort study on intake of retinol, vitamins C and E, and carotenoids and prostate cancer risk (Netherlands). Cancer Causes Control 2002;13:573-82. Institute of Medicine, Food and Nutrition Board. Beta-carotene and other carotenoids. Dietary reference intakes for vitamin C, vitamin E, selenium, and carotenoids. Washington, D.C.: National Academy Press; 2000:325-400. Stahl W, Sies H. Uptake of lycopene and its geometrical isomers is greater from heat processed than from unprocessed tomato juice in humans. J Nutr 1992;122:2161-6. Tang Y, Parmakhtiar B, Simoneau AR, et al. Lycopene enhances docetaxel’s effect in castration-resistant prostate cancer associated with insulin-like growth factor I receptor levels. Neoplasia. 2011 Feb;13(2):108-19. Kristal AR, Till C, Platz EA, et al. Serum lycopene concentration and prostate cancer risk: results from the Prostate Cancer Prevention Trial. Cancer Epidemiol Biomarkers Prev. 2011 Apr;20(4):638-46. Caroselli C, Bruno G, Manara F. A rare cutaneous case of carotenosis cutis: lycopenaemia. Ann Nutr Metab. 2007;51(6):571-3. Dos Santos VM, Camilo AG, De Souza LA, et al. A woman with treated breast cancer, recent neurological symptoms and xanthoderma. Acta Med Iran. 2013 Apr 6;51(3):195-8. Song B, Liu K, Gao Y, et al. Lycopene and risk of cardiovascular diseases: A meta-analysis of observational studies. Mol Nutr Food Res. 2017 Sep;61(9). Gajendragadkar PR, Hubsch A, Mäki-Petäjä KM, Serg M, Wilkinson IB, Cheriyan J. Effects of oral lycopene supplementation on vascular function in patients with cardiovascular disease and healthy volunteers: a randomised controlled trial. PLoS One. 2014 Jun 9;9(6):e99070. Bandeira AC, da Silva RC, Rossoni JV Júnior, et al. Lycopene pretreatment improves hepatotoxicity induced by acetaminophen in C57BL/6 mice. Bioorg Med Chem. 2017 Feb 1;25(3):1057-1065. Jhou BY, Song TY, Lee I, Hu ML, Yang NC. Lycopene Inhibits Metastasis of Human Liver Adenocarcinoma SK-Hep-1 Cells by Downregulation of NADPH Oxidase 4 Protein Expression. J Agric Food Chem. 2017 Aug 16;65(32):6893-6903. Morgia G, Voce S, Palmieri F, et al. Association between selenium and lycopene supplementation and incidence of prostate cancer: Results from the post-hoc analysis of the procomb trial. Phytomedicine. 2017 Oct 15;34:1-5. Gann PH, Deaton RJ, Rueter EE, et al. A Phase II Randomized Trial of Lycopene-Rich Tomato Extract Among Men with High-Grade Prostatic Intraepithelial Neoplasia. Nutr Cancer. 2015;67(7):1104-12. Beynon RA, Richmond RC, Santos Ferreira DL, et al. Investigating the effects of lycopene and green tea on the metabolome of men at risk of prostate cancer: The ProDiet randomised controlled trial. Int J Cancer. Oct 16 2018.